Such was the conversation after opening night of Dark and Stormy's The Maids, when I said, "I have no idea what just happened." Friends, I'm not a theater person (Maureen). I've never studied or created theater, I come at this theater blogging thing strictly from the audience perspective. Hence the playwright and this play were unfamiliar to me before last night. All I knew is that it was about two maids who planned to kill their employer. Whether or not they succeeded in that I really can't tell you, but I don't think that's the point. 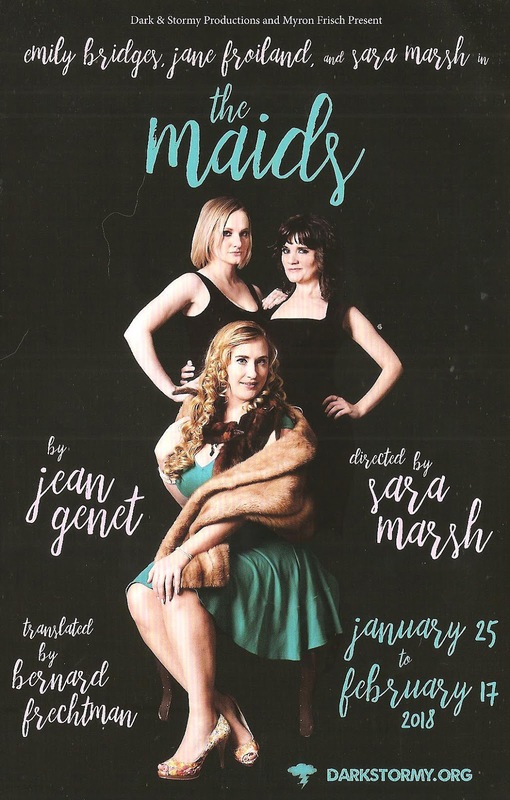 I'm actually not sure what the point is, but this play is fascinating, if perplexing, and worth seeing for the performances of this three-person female cast alone. When the cat's away, the mice will play. In this case the cat is a wealthy woman in Paris known only as "Madame," and the mice are her two maids, sisters (I think?) Claire and Solange. And the game they play at is one of them killing the Madame, played by the other one. 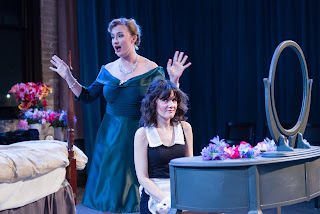 The play begins and ends with this playacting scene, as Solange and Claire play maid and Madame in an exaggerated way, sometimes stepping out of character to correct the other. But perhaps the sisters should have agreed upon a safe word, because the playacting sometimes goes a little too far. They're interrupted by the return of Madame, when they have a chance to put their money where their mouth is. Maybe they do, maybe they don't, but let's just say things don't go as smoothly as planned (do they ever?). I was reminded of two recent TV adaptations of Margaret Atwood novels - Alias Grace (about a maid convicted for killing her employers) and The Handmaid's Tale (about a dystopian future/present where women are forced into strict roles). While Solange and Grace don't have it as bad as Offred and Ofglen and the other handmaids, they share Grace's feelings of injustice at the gross class differences they experience every day. And perhaps also her mental illness. The intimate space at Dark and Stormy's studio in the Grain Belt Warehouse in Northeast Minneapolis works well for this story, putting us almost in the middle of the action. The maids vacuum under our feet, and a violent fight scene (choreographed by Annie Enneking, natch) feels almost too real. The simple set is similar to their last show, Fool for Love (only less shabby), and serves the story well, with just a bed, vanity table, and tons of flowers. The play is darkly funny, with lots of symbolic language and diversions into tangents. It borders on campy, except for the dark subject matter. Lighting and sound cues help to orient us to where we are, except when they confuse us (well, me). I wish I could read a Vulture recap of this pay, like I do when I watch a particularly complex episode episode of TV. One thing that wasn't confusing - the excellent performances of this cast of strong women. Jane Froiland (a nominee for the TCTB Award for favorite dramatic performance by an individual in 2017) is convincing both as the pretend Madame, and the less powerful sister Claire. Sara Marsh (who also directs) is particularly strong in Solange's meandering final monologue that covers the full gamut of emotions. Emily Bridges (yes, of The Bridges) has too little stage time as Madame, floating in wearing a beautiful green dress (costume design by Lisa Jones) and almost blinding bling, like a summer breeze that's gone too soon. 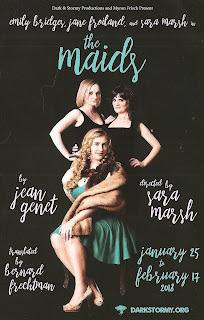 The Maids continue their Dark and Stormy games through February 17.